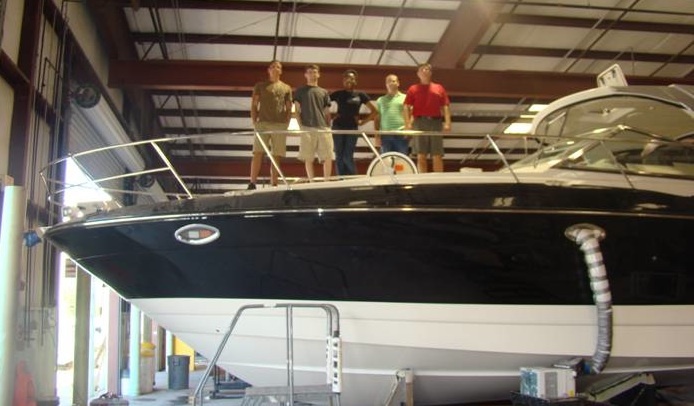 WILLISTON, FL: ISE undergraduates Fernando Blaubach, Ronny Gomes, Genivier Peterson and Jared Stewart recently completed summer internships with Monterey Boats. During the six-week experience, they worked on a variety of problems, including stockroom flow improvements, and new boat model documentation and bill of materials development. Tim Reid, Process Engineering Manager at Monterey Boats shown aboard a new vessel with the students, oversaw the team and was happy to provide the practical experience to augment their academic studies. He also noted that the students “brought a lot to the table, technically,” too, during a recent debrief about the experience. “It was helpful to see the application of everything we’ve learned,” added Peterson.